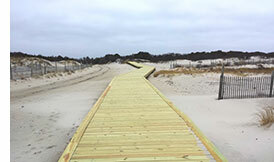 (15/P11) TRENTON – Fisherman’s Walkway, a popular and functional surf fishing access point at Island Beach State Park that was completely destroyed by Superstorm Sandy, has been fully restored and is now reopened, Department of Environmental Protection Commissioner Bob Martin announced today. 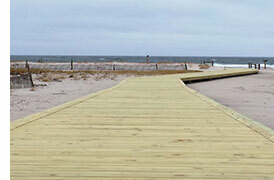 Approximately 1,000 feet of wooden walkway, measuring about eight feet in width, has been constructed starting from Parking Area 7, providing fishing access for persons with disabilities and other anglers on foot who prefer more mobility in transporting their fishing equipment from the parking area to the ocean. Work on the walkway began in late September and was completed in late December by GCS Contractors Corp. The walkway officially reopened this month after inspection. The $203,000 project was funded by Corporate Business Tax dollars. The DEP is seeking reimbursement from the Federal Emergency Management Agency. Fisherman’s Walkway has been a popular destination for people with disabilities, anglers and other pedestrians since it was first constructed in 1995 with funds through the Americans With Disabilities Act. Its location within the park is south of lifeguarded swimming areas and north of mobile sport fishing access roads. A major repair of the Sandy-damaged north jetty at Barnegat Inlet, at the southern tip of the park, was completed in October. A state-funded dune replenishment project to bolster a vulnerable section of the northern most section of the beach was completed in 2013.